Sjögren's Syndrome (SS) is a systemic chronic inflam- matory disease characterized by lymphocytic infiltrates in exocrine organs. Its main clinical features are ocular and oral dryness due to hypofunction of lachrymal and salivary glands, parotid gland enlargement, thyroid dysfunction, hyperim- munoglobulinemia, and a variety of serum autoantibodies positive [1Kittridge A, Routhouska SB, Korman NJ. Dermatologic manifestations of Sjögren syndrome. J Cutan Med Surg 2011; 15(1): 8-14. [http://dx.doi.org/10.2310/7750.2010.09033] [PMID: 21291650] ]. There are many other diseases that can also cause sicca symptoms [2Fox RI. Sjögren’s syndrome. Lancet 2005; 366(9482): 321-31. [http://dx.doi.org/10.1016/S0140-6736(05)66990-5] [PMID: 16039 337] ], and there are no specific examinations for SS, for example the lack of specific autoantibodies and even Labial Salivary Gland Biopsy (LSGB) cannot be used as a single gold standard. All the above reasons lead to difficulty in a definite diagnosis of SS. The American-European Consensus Group’s (AECG) criteria for the classification of SS were proposed in 2002 and were the most commonly used criteria for the diagnosis of SS in the past, which were with high sensitivity of 97.2% but low specificity of 48.6% in the diagnosis of primary SS (PSS), and with high specificity of 97.2% but low sensitivity of 64.7% in the diagnosis of secondary SS (SSS) [3Vitali C, Bombardieri S, Jonsson R, et al. Classification criteria for Sjögren’s syndrome: A revised version of the European criteria proposed by the American-European Consensus Group. Ann Rheum Dis 2002; 61(6): 554-8. [http://dx.doi.org/10.1136/ard.61.6.554] [PMID: 12006334] -5Tzioufas AG, Voulgarelis M. Update on Sjögren’s syndrome autoimmune epithelitis: From classification to increased neoplasias. Best Pract Res Clin Rheumatol 2007; 21(6): 989-1010. [http://dx.doi.org/10.1016/j.berh.2007.09.001] [PMID: 18068857] ]. A new set of classification criteria has been developed by the Sjögren's Syndrome International Collaborative Clinical Alliance (SICCA) and accepted as a provisional criteria set by the American College of Rheumatology (ACR) in 2012 in order to improve the efficiency of diagnosis. The ACR criteria have higher sensitivity and specificity which are 93% and 95% respectively. And the new criteria do not distinguish between PSS and SSS [6Gálvez J, Sáiz E, López P, et al. Diagnostic evaluation and classification criteria in Sjögren’s syndrome. Joint Bone Spine 2009; 76(1): 44-9. [http://dx.doi.org/10.1016/j.jbspin.2008.02.017] [PMID: 18829369] , 7Shiboski SC, Shiboski CH, Criswell L, et al. American college of rheumatology classification criteria for Sjögren’s syndrome: A data-driven, expert consensus approach in the Sjögren’s Int Collab. Clin. Alliance cohort. Arthritis Care Res (Hoboken) 2012; 64(4): 475-87. [http://dx.doi.org/10.1002/acr.21591] [PMID: 22563590] ]. The disadvantage of the ACR criteria is heavily reliant on LSGB. So, we propose to develop simple, practical classification criteria of SS to reduce reliance on LSGB, which are defined as new noninvasive score (NIS criteria) in classification diagnosis of SS. We undertook this study to compare the NIS criteria to the AECG criteria in patients with suspected SS that have been carefully evaluated for SS. Schirmer’s I test was considered abnormal if ≤5 mm/5 min while vital dye staining ≥4 according to van Bijsterveld’s scoring system, and the unstimulated whole salivary flow (UWSF) < 1.5Ml/ 15 min. Indirect Immunofluorescence (IIF), Immunoblotting Test (IBT) and Enzyme-Linked Immuno- absorbent Assay (ELISA) were employed to detect Anti-Nuclear Antibody (ANA), Anti-Extractable Nuclear Antigen (ENA) Antibody and anti-double strand DNA (dsDNA) antibody, respectively, and Rheumatoid Factor (RF, IgM and IgA isotypes) using in-house enzyme-linked immunosorbent assays. A positive LSGB should have a focus score of at least 1 focus/4 mm2 [8van Stein-Callenfels D, Tan J, Bloemena E, et al. The role of a labial salivary gland biopsy in the diagnostic procedure for Sjögren’s syndrome; A study of 94 cases. Med Oral Patol Oral Cir Bucal 2014; 19(4): e372-6. [http://dx.doi.org/10.4317/medoral.20010] [PMID: 24880453] ]. A focus is defined as the presence of a cluster of at least 50 lymphocytes per 4 mm2 glandular tissue adjacent to normal appearing mucous acini [8van Stein-Callenfels D, Tan J, Bloemena E, et al. The role of a labial salivary gland biopsy in the diagnostic procedure for Sjögren’s syndrome; A study of 94 cases. Med Oral Patol Oral Cir Bucal 2014; 19(4): e372-6. [http://dx.doi.org/10.4317/medoral.20010] [PMID: 24880453] ]. For the patients who were suspected for the existence of autoimmune thyroid disease, thyroid function and thyroid autoantibodies were also detected. Each patient was classified according to both the AECG criteria [9Vitali C, Bombardieri S, Jonsson R, et al. Classification criteria for Sjögren’s syndrome: A revised version of the European criteria proposed by the American-European Consensus Group. Ann Rheum Dis 2002; 61(6): 554-8. [http://dx.doi.org/10.1136/ard.61.6.554] [PMID: 12006334] , 10Rasmussen A, Ice JA, Li H, et al. Comparison of the American-European Consensus Group Sjogren’s syndrome classification criteria to newly proposed American College of Rheumatology criteria in a large, carefully characterised sicca cohort. Ann Rheum Dis 2014; 73(1): 31-8. [http://dx.doi.org/10.1136/annrheumdis-2013-203845] [PMID: 23968 620] ] and the newly proposed NIS criteria [7Shiboski SC, Shiboski CH, Criswell L, et al. American college of rheumatology classification criteria for Sjögren’s syndrome: A data-driven, expert consensus approach in the Sjögren’s Int Collab. Clin. Alliance cohort. Arthritis Care Res (Hoboken) 2012; 64(4): 475-87. [http://dx.doi.org/10.1002/acr.21591] [PMID: 22563590] , 11Cornec D, Saraux A, Cochener B, et al. Level of agreement between 2002 American-European consensus group and 2012 american college of rheumatology classification criteria for Sjögren’s syndrome and reasons for discrepancies. Arthritis Res Ther 2014; 16(2): R74. [http://dx.doi.org/10.1186/ar4514] [PMID: 24642022] ]. We eliminated from the analysis, the patients who did not have results for all the features of both classification systems with the exception of sialography and scintigraphy (Table 1). Comparison of the AECG Criteria and NIS Criteria for SS. Clinical characteristics of SS and non-SS patients. The results of diagnostic tests of NIS criteria in SS patients. Comparison of the diagnostic efficiency of ROC curves. NIS criteria in diagnosis of SS. This retrospective analysis is the first study to develop a noninvasive classification criteria for SS. SS primarily affects women, with a female-male ratio of 20:1 in this study, slightly higher than the previous reported 9:1 [12Kassan SS, Moutsopoulos HM. Clinical manifestations and early diagnosis of Sjögren syndrome. Arch Intern Med 2004; 164(12): 1275-84. [http://dx.doi.org/10.1001/archinte.164.12.1275] [PMID: 15226160] ], and may occur in patients of all ages but typically has its onset in the fourth to sixth decades of life [12Kassan SS, Moutsopoulos HM. Clinical manifestations and early diagnosis of Sjögren syndrome. Arch Intern Med 2004; 164(12): 1275-84. [http://dx.doi.org/10.1001/archinte.164.12.1275] [PMID: 15226160] ]. In the present study, there were statistical differences of ocular and oral symptoms and signs between the SS group and non-SS group, which suggested us to take these items into account of the new set criteria. In fact, these items were already included in the AECG criteria. The ACR Ocular Staining Score (OSS) was not considered in the new criteria because of low specificity. Unexpectedly, the differences in autoantibodies were not statistically significant. But the serological items were still retained in the new criteria considering a variety of auto- antibodies, because these autoantibodies are sensitive in the diagnosis of SS although with low specificity [1Kittridge A, Routhouska SB, Korman NJ. Dermatologic manifestations of Sjögren syndrome. J Cutan Med Surg 2011; 15(1): 8-14. [http://dx.doi.org/10.2310/7750.2010.09033] [PMID: 21291650] ]. Positive RF plus ANA ≥1:320 was not considered as one of the serological items, because ANA pattern was not distinguished in this item and also because it was observed in the study that for most patients with positive RF plus ANA ≥1:320, anti-SSA or anti-SSB or anti-RO52 antibodies were mostly positive. SS along with thyroid disease diagnosed with laboratory data and clinical presentation were reported and the most common thyroid disease found was autoimmune thyroiditis and the most common hormonal pattern was subclinical hy- pothyroidism [13Jara LJ, Navarro C, Brito-Zerón MdelP, García-Carrasco M, Escárcega RO, Ramos-Casals M. Thyroid disease in Sjögren’s syndrome. Clin Rheumatol 2007; 26(10): 1601-6. [http://dx.doi.org/10.1007/s10067-007-0638-6] [PMID: 17558463] , 14D’Arbonneau F, Ansart S, Le Berre R, Dueymes M, Youinou P, Pennec YL. Thyroid dysfunction in primary Sjögren’s syndrome: A long-term followup study. 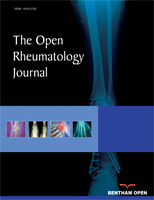 Arthritis Rheum 2003; 49(6): 804-9. [http://dx.doi.org/10.1002/art.11460] [PMID: 14673967] ]. In this study, the existence of autoimmune thyroid disease between the two groups was statistical significance. Considering the low sensitivity, it was included as an additional item. Positive rate of LSGB was significantly higher in the SS group than the non-SS group in the present study. The specificity of LSGB in the diagnosis of SS was high and the mistake diagnostic rate was only 14.7%, but the sensitivity was not that high and the omission diagnostic rate was up to 31.0%. These results were somewhat similar to a previous study, in which there was an even higher specificity of 100% and the sensitivity was 75.0% [15Baeteman C, Guyot L, Bouvenot J, et al. Should minor salivary gland biopsy still be performed?. Rev Stomatol Chir Maxillofac 2008; 109(3): 143-7. [http://dx.doi.org/10.1016/j.stomax.2007.10.007] [PMID: 18533206] ]. Considering the specificity and sensitivity, although LSGB was very important in the diagnosis of SS, it should not be used as a single gold standard. The diagnostic accuracy of the AECG criteria was only 77.6%, and the mistake diagnostic rate and omission diagnostic rate were 17.6% and 26.2%, respectively. It was not superior to using LSGB as a single standard.